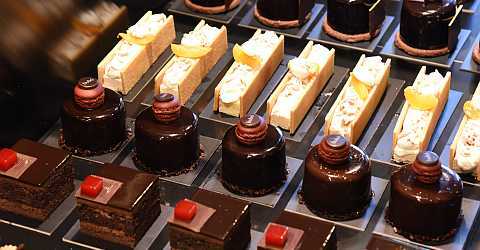 Exceptional chocolate pastries in Barcelona! During our 2.5 hours long Barcelona Pastry Walk Tour our German and English speaking guide will lead you along the chocolate route in Barcelona's Old Town district. Our guide will tell you with abandon about the history and the development of chocolate from the past up to the present. Chocolate was and still is rated higly by Barcelona's residents, which affects the quality and taste of the pastries in a positive way. One of the confectionery shops that you will go to, has an award for the world's greatest pastries. You should probably plan on eating a few more calories on this day. Please enter the number of people you would like to book for on the upper right and select the desired date. Immediately after booking, we will send you an E-mail confirming that we received your booking. Within 48 hours you will receive a mandatory booking confirmation via E-mail. Meeting point: Fuente Canaletas. With the booking confirmation you will receive detailed directions. A cancellation free of charge is possible up tp 3 days before the confirmed tour date. In case of a later cancellation or a no-show a refund is not possible. You will be amazed: a confectionery with an award for the world's best tart is among the two different tastings. It is best that you plan to spend a few more calories for this day. The tour starts at Escribà, a confectionery shop at a corner, where we will be able to admire Barcelona's legendary, characteristic and modern beauty. We will walk through the Gothic district and its defining gourmet shops on the Petrixol street, where you can find numerous chocolatiers. Please enter the number of persons you want to book, at least 2 persons and choose between the tour in the morning and in the afternoon. An additional one time fee of €24,90 will be charged.